2012 “The Rammellzee Galaxseum,” Children’s Museum of the Arts, New York. 2011 “Art in the Streets,” Museum of Contemporary Art, Los Angeles. 2001 The Rhodes Family Award for Outstanding Achievement in Animation. 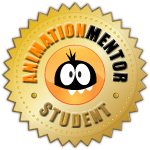 I’m an award-winning Montreal-based character animator with 15 years of experience working in the film and television industry, and 9 years teaching as a college level animation instructor. Professor in MFA Illustration. Wrote the curriculum for the course, Illustration in Motion. After Effects animator on a transmedia ad campaign for Hershey’s Jolly Ranchers. Flash animator for the pharmaceutical commercial, Movantik. Lead animator on TBS station ID, Presidents’ Day Off. Oversaw and animated a four minute corporate video about Netflix founder, Reed Hastings. Traditionally animated using Toon Boom software. Flash animator for the cable television spots entitled SNY Fanmation. Flash animator for a series of five animated commercials for Toyota. 2D animator for a commercial for Redbox. Inbetween animator for the PBS series POV. Traditional Flash animator for the Comedy Central television series Ugly Americans. Flash and After Effects animator for the Playhouse Disney television series Little Einsteins. After Effects animator for the Nick Jr. television series Wonder Pets. Layout artist for the television series Friday: The Animated Series. After Effects animator for the second season of the Nick Jr. television series Little Bill. Inbetweener, cel cleaner, and exposure sheet checker for the feature film Hair High. Assistant animator to Emily Hubley for the animated segments in the live-action feature Hedwig and the Angry Inch.